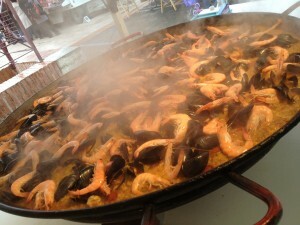 I did not see anyone buying this paella but when we came out of the museum at noon his place was closed down. Today we visited two museums; the first was in the small town of L’isle Jourdain about a half hour drive west of Toulouse. This little town had its farmers market day in the square right in front of the museum we were going to and since we arrived a bit early we had a chance to do some looking around. The most fun part of this for me was the large pots of food that were being cooked. Take a look at this huge pot of paella with shrimp and mussels on top! This one is not a particularly fancy one. The Musee Europeen d’Art Campanaire was a very interesting local museum. It focuses on bells and tower clocks. The bells were interesting, being based on the development of bells for use on domestic livestock but they had expanded it to development of bells and uses throughout the world. 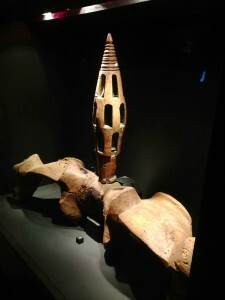 These bells for livestock were specific to the region and developed into quite elaborate things. Fun to see a museum doing something to broaden their local folks to the international community. 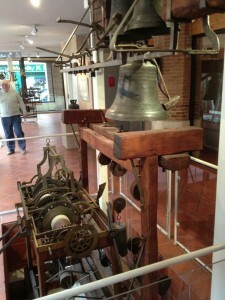 It was an interactive museum so they had lots of bells sounding off around the museum. They even had a carrillon that one of our members was invited to play. 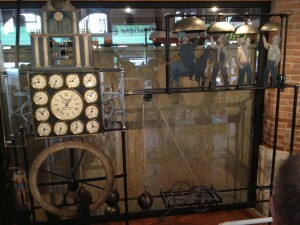 The Bastille clock – the clock keeper that took care of all the clocks in the museum is in the background of the picture. The tower clocks were, of course the most interesting. The most interesting to me was one that they said was the only remaining piece of the Bastille that has remained after the revolution. All, or almost all, of the tower clocks were operating or operable. They had a nice display of four clocks that demonstrated the development through the centuries. The date indications are on the big wheel in the bottom left. The man points to the current date and the woman on the very bottom show what to name the child. There was also a unique clock that had a date function with an indicator with the list of saints for each day. There was an indicator for the current day and also an indicator for the day exactly nine months previous. This was used to name a child after a saint based on the day of conception. After a few hours in this museum we went back to Toulouse for a very nice lunch (this will be in another post if I get to it). 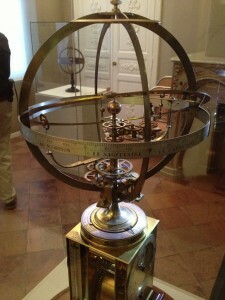 The astrolabe part of a Janvier clock. The astrolabe was made in 1773. In the afternoon we went to the Musee Dupuy. This museum had an excellent historical collection as well as some great pieces by clockmaker Janvier, Berthoud and makers local to Toulouse. We also had a demonstration of a musical clock. Sorry that the video doesn’t show the moving parts of the clock very well – the whole clock is so large and the moving parts quite small. But this is the best I could do. There is a lady who plays a music box by cranking a handle and then there is a small bird on the right hand side that “mimics” the music box. Our guide, who is a member of the clock organization there and the official watch keeper of the museum gives a little intro before the demonstration. I had trouble relating the explanation with the actual musical part but oh well, the music sounds very nice. This was the only day that we had any significant rain but it did not put a damper on our visits. It was a little bit cold to be standing outside for long and may have prevented some of us from walking back to the hotel instead of taking the bus. We ended the day and the tour with a banquet at the hotel. While the food was not the worst we ate during the trip, it was also not the best. We all shared something that surprised us about the trip – for me it was how many times I was simply aghast (in a good way) at what we had in front of us – from the vast stores of the CNAM, where we were cut loose to wander, to the simple but fantastic collection of tower clocks in Charroux, I was continually taken aback at how rich a treasure we had in front of us. A very worthwhile trip. And it was nice to meet others who were as interested in these things as myself. We are an odd group – people who don’t get tired of talking about clocks and watches. Tomorrow I get a different kind of experience – riding the TGV back to Paris. And then I will be flying back to the US from Charles de Gaulle airport. I wish it didn’t take me two whole days to get home but it will give me a few days to try to rework my sleeping and eating habits to recondition from jet lag.